Senate Republicans are outraged that anyone would question Neil Gorsuch. How Dare You Question Our Precious Nominee? Republicans broke every rule to block Merrick Garland. Now, they’re outraged that anyone would challenge Neil Gorsuch. 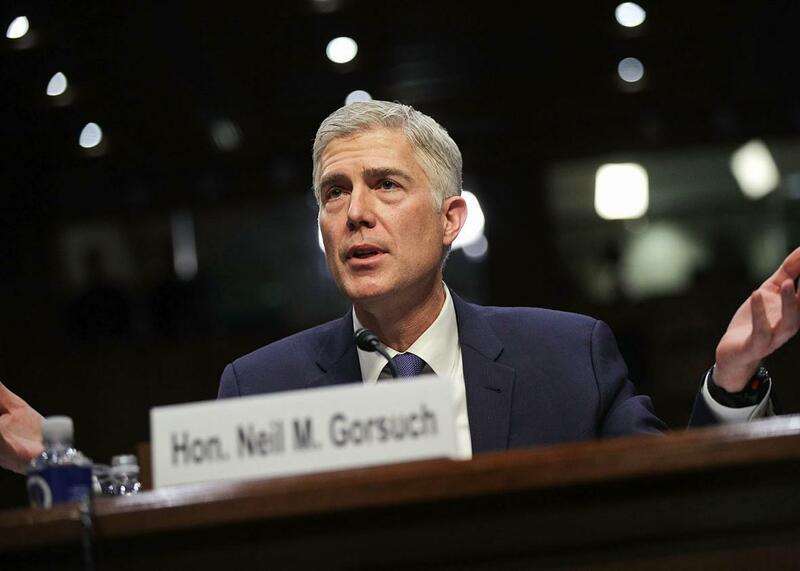 Judge Neil Gorsuch speaks during the first day of his Supreme Court confirmation hearing before the Senate Judiciary Committee on Monday in Washington, D.C. It is an article of faith among Senate Republicans that everything liberals do is just goddamn awful, from the unelected left-wing justices who “legislate from the bench” to the blocking of Robert Bork in 1987 to the lame cries for equal treatment of everyone under the law. Indeed, Senate Republicans have so mastered the art of outsize umbrage that at Monday’s hearing for Judge Merrick Garland Neil Gorsuch, to fill a Supreme Court seat they themselves blocked and obstructed for over a year, the one note of agreement they sounded was an angry one. They are angry that Democrats believe an Obama nominee should have been afforded the courtesy of a hearing and a vote. They are angry that their nominee—who was picked by the president with promises about how he would vote in abortion and gun cases—will surely be asked about how he will vote in abortion and gun cases. But mostly they are really just incredibly steamed that Senate Democrats are even a little bit mad. Because anger is sort of the Republicans’ thing. Get your own thing, Democrats. Sen. Chuck Grassley, the Republican chairman of the Judiciary Committee, was furious that the cardinal principles of “separation of powers” and respect for an “independent” judicial branch are not being honored by Senate Democrats. This is the same Chuck Grassley who pre-emptively attacked the Supreme Court and its chief justice last spring for any attempts to politicize the court vacancy. GOP Sen. Orrin Hatch lectured the Judiciary Committee about the fact that the Senate “owes the president deference over his judicial nominees.” Hearing this, Democratic Sen. Patrick Leahy of Vermont about fell out of his chair. The president’s audacity in seeking to fill that seat with a justice of his choosing was indeed so outrageous, Cruz argued in the fall, that if Hillary Clinton were to be elected the Senate should leave Scalia’s seat open indefinitely. After Trump’s victory, Cruz is still enraged, but now it’s because Democrats are ignoring the fact that since a Republican won, the election was actually a “referendum on the kind of justice that should replace Justice Scalia.” Cruz is beside himself with fury about questions regarding Merrick Garland Neil Gorsuch’s legitimacy. Don’t these Democrats know that only Ted Cruz gets to question a jurist’s legitimacy? To ensure that this is so, Cruz officially declares that effective, like right now, “Judge Gorsuch is no ordinary nominee. … His nomination carries with it a super legitimacy.” Super legitimacy, for the uninitiated, is the power to outrun your own speeding hypocrisy. One angry senator after another cautioned the nominee not to answer any question about anything ever. Sen. Lindsey Graham, who is mainly just angry that everyone in the Senate isn’t Lindsey Graham, said he is post-anger. He isn’t even angry that Justice Sonia Sotomayor and Justice Elena Kagan vote with the liberals 100 percent of the time (they don’t) because what else can you really expect from liberal judges. Senate Republicans took turns being angry that anything other than Scalia-era “originalism” be given voice in the jurisprudential universe, despite the fact that there is maybe only one “originalist” sitting on the Supreme Court. They were enraged that any nominee should have to sit and have his record scrutinized given that 10 years ago—before he was a judge—this Gorsuch fellow was confirmed with flying colors. It’s all too obscene to countenance. A few of the Democrats appeared ready to rumble, if rumbling involves offering up many case citations. The Republicans’ fury, by contrast, was unbridled: How dare Democrats put their nice nominee through the indignity of a hearing on the merits when they could instead just lie down on the Senate floor and form a human red carpet for the judge to walk? The nominee was very emotional and eloquent about his daughters, black robes, and farm animals. He is extremely likeable. He named “little guys” he has, in the past, supported. That seemed to make the GOP’s rage burn even hotter. Who would dare attack a guy who likes chickens and original public meaning? If you’re keeping score after Day 1: Senate Democrats have now defrosted a trucker, name-checked Merrick Garland, and been lectured that Senate Republicans have no choice but to be mean because Democrats have no judicial theory, no coherent strategy, and no intellectual right to fill “Scalia’s seat.” On the other side of the aisle, the GOP has nothing but bottomless umbrage. It’s taken them this far. Why would they stop now?